What If . . . Jack the Ripper Were A Time-Traveling Chick? From the department of questions you never wanted answered comes the belated sequel to cult fave Time After Time, where HG Wells and Jack the Ripper travel to the 1970s and duke it out. Now Jack is back as Jaclyn. 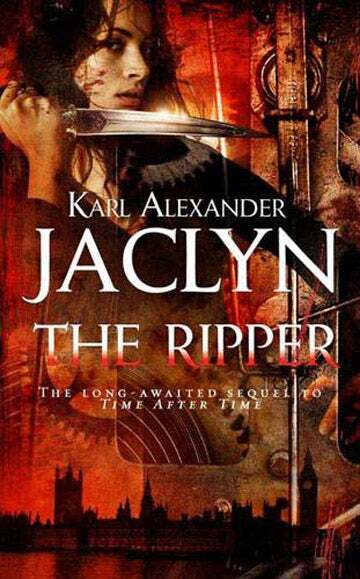 Jaclyn the Ripper is written by Karl Alexander, who also penned the bestselling Time After Time. That novel became a genuinely cool movie with Malcolm McDowell as HG Wells (who invents a real time machine) and the always-scary David Warner as his buddy who (unbeknownst to Wells) is actually Jack the Ripper. If you recall, at the end of Time After Time, HG banishes Jack to a nethertime and he and his modern-day love Amy return to the late nineteenth century to live the steampunk romance dream. Sadly Alexander fell prey to deadly sequelitis and churned out Jaclyn the Ripper, published by Forge this month. Amy is lonely for her family, so she gets into the time machine and everything goes haywire immediately. She winds up in 2009, and some of her DNA swirls out into nethertime, unleashing Jack and turning him into Jaclyn! Yes, this novel is part of the fine tradition that brought you other astonishing "let's switch genders and make exactly the same story" tales like Dr. Jekyll and Ms. Hyde. Imagine - now Jack is Jaclyn! How will HG ever save his lady from . . . a lady?! In the novel Jaclyn's beauty and gender change give her a huge advantage in avoiding Wells and the police. But her more complex female emotions drive her to do things she wouldn't do as a male psychopath. And she seems more intrigued with betrayal than she was as a man. "As I wrote, Jaclyn's inner character became a psychological study of men and women," Alexander says. "An exploration of how the genders see and rationalize violence, how they respond to love, how they confuse each other." In fact, in the midst of this rollicking thrill ride, you'll find yourself captivated by the thought of how Jaclyn will handle her first sexual experience with a man, and how she will handle falling in love. Yeah, those "more complex female emotions" always make serial killing into something romantic and nurturing. And while you're contemplating that, just think of all the wacky fun you'll have reading about how HG deals with twenty-first century contraptions like cell phones! I am left with two burning questions. Why bring out a sequel now, when the original book and movie have faded into warm, happy memories? But more to the point, since sequels and reboots are (yes I will admit it!) sometimes a good idea, why do a sequel whose premise is more like a Blake Edwards flick than a scifi-thriller?